*originally published December 6, 2011. So, every year, I make what my boys (hubbs included) call, the “Un-Christmas” Christmas cookie: Chocolate chip-butterscotch chip-macadamia nut cookies (otherwise known as “Mondo” cookies). These are the ones my guys go back to time and again and that’s why I bother. Plus, I rarely make this treat the rest of the year so, in our house, they’ve become a “Christmas” cookie in their own right. Who says I’m not a Christmas cookie? Add salt and baking soda, mix in well. Stir in flour slowly until blended then stir in chips and nuts. Stir well until all ingredients are blended, especially any remaining flour. *The dough may feel a bit stiff, just take your time and work in the flour. 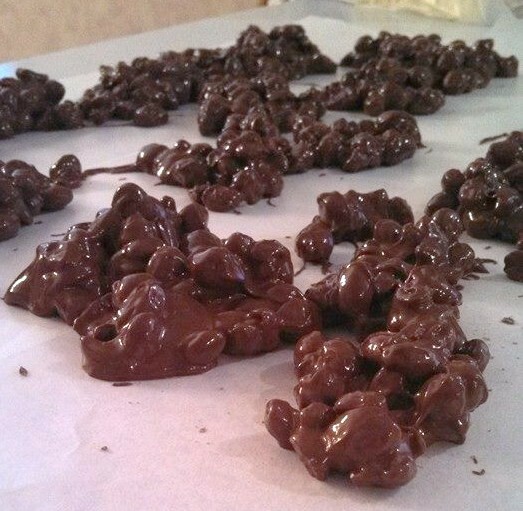 Hubbs’ idea of heaven ..
There’s one more treat I’ll make for my chocolate-loving fiends and that’s some Chocolate covered peanut clusters. Yep – like last year – I have decided to stop watering the weeds. How have your Christmas traditions evolved over the years? What’s your family’s “must have” Holiday treat? 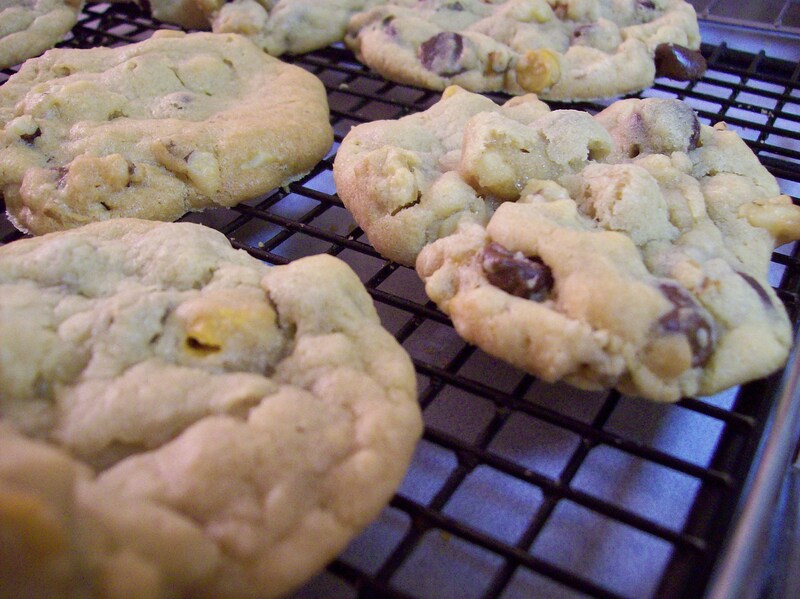 I have never made cookies with macadamia nuts, but I sure do love them. I have to make these soon to stuff the snowman cookie jar. Doubling the recipe is smart and a time saver. A friend from school brought these. If I don’t make them, daughters do. You need a box of vanilla wafers. Sandwich two at a time with peanut butter in between. Dip in melted sweet or dark chocolate or white chocolate. Place on waxed paper to cool. They’re wonderful like homemade Reese’s pieces. the Mac nuts are often on sale at this time of year, which helps, but you can also use pecans or walnuts – any are good. I’ll take two dozen mondos, MJ. The checks in the mail. You are one smart cookie (I couldn’t resist). I stopped making cookies from the magazines. My husband only eats chocolate chip so that’s what I make along with a few Austrian ones just for my brother and me. Your recipe is a take on the chocolate chip with a few added treasures! Yum…love macademia nut cookies! And Georgette’s recipe sounds good, too! I used to make pressed cookies (loved the cookie shooter), and other holiday varieties. One year, hubby asked why I didn’t just make oatmeal, chocolate chip, or fruit cocktail cookies. That was the end of “Christmas” cookies. I’ll definitely try the Mondo cookies. They sound amazing! Your recipes are always as good as you promise they’ll be! BTW, I made the creamed corn you recommended for Thanksgiving. I’ve been informed it will be a requirement at all future Thanksgiving meals in our family. Thanks! My daughter and I make Christmas cookies every year, but we’ve scaled back to the absolute favorites and easy varieties. Our fave is a sugar cookie recipe that has been in Mark’s family for years. They are SO buttery, they melt in your mouth. We roll them and make cutouts which Kacey always frosts. They’re a big hit around here. So glad you loved Leah’s creamed corn recipe – it’s the bomb! Rich and hearty but oh so good. 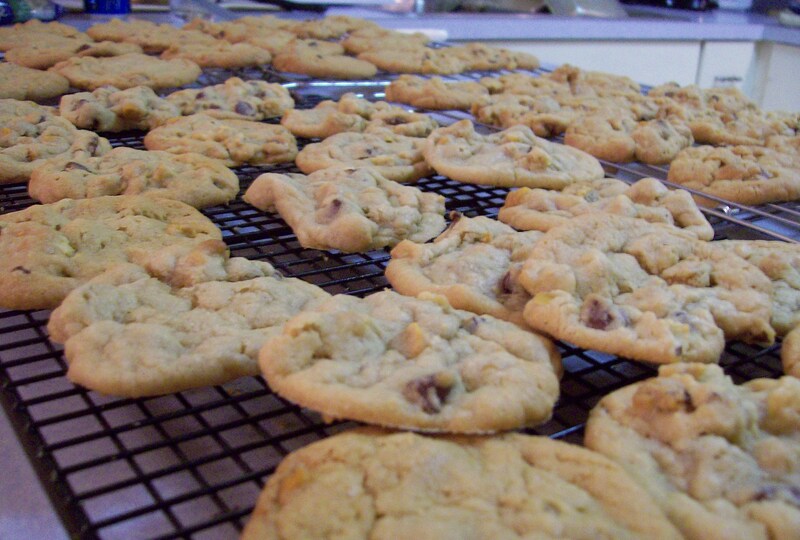 Those cookies are amazing and I’ll be making some for hubbs later today.